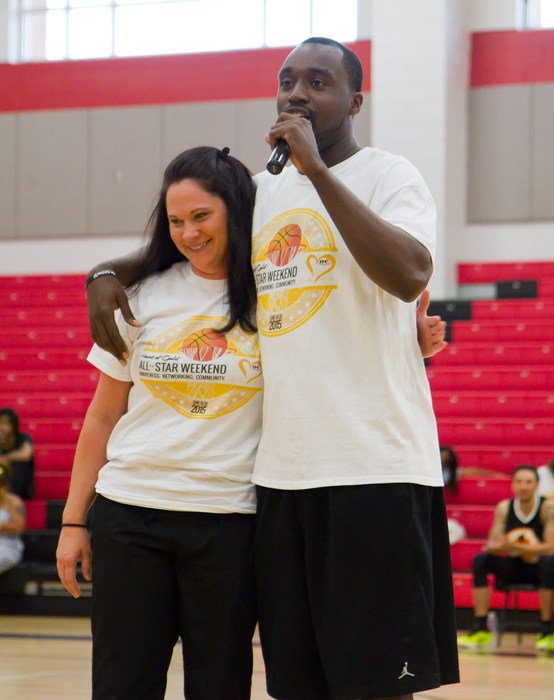 Omar Carter’s first love was basketball. But when his life was nearly taken from him while playing the game, his near-death experience became his new calling. This summer, Carter and his nonprofit organization, The OC Foundation, hosted the first Sudden Cardiac Arrest Awareness Campaign in Charlotte. Carter, a Charlotte native who played for Charlotte Christian High School, Appalachian State University and professionally in Brazil, started the organization to help bring awareness to this life-threatening event, one that he knows all too well. Omar Carter, right, speaks to a crowd while embracing Kelly Thomas, a cardiac intensive care unit nurse at Carolinas Medical Center, who helped save his life when he collapsed playing basketball two years ago. Just over two years ago, Carter was back in Charlotte after finishing is first professional basketball season. He was playing in a summer league game at a recreation center when he collapsed in the middle of a game. Miraculously Kelly Thomas, a nurse at Carolinas Medical Center’s cardiac intensive care unit, was in the stands that day and helped perform CPR and administer an automated external defibrillator (AED) on Carter’s chest. His heart stopped for 13 minutes until a faint pulse was detected before paramedics arrived. He then spent two days in a coma before awakening. He was diagnosed with Athletes Heart Syndrome, a condition where the heart is too large for the body, in addition to having a heart arrhythmia, and has been implanted with a defibrillator. He has since been able to make a full recovery, though his dream of continuing to play professionally was cut short. At 25 and what he thought was the beginning of a long athletic career, Carter felt like his close encounter was more than a close call, but a true calling. He started The OC Foundation, and partnering with Carolinas HealthCare System and its physicians and nurses, has set a goal of teaching 1 million people how to perform CPR, as well as educating them on the proper way to use an AED. He also wants to offer free ultrasounds and EKGs to young athletes. But in order for his new foundation to take flight, he needed to get the word out. He recruited doctors, nurses and staff at Carolinas HealthCare System to volunteer for events and activities. But there was one contact Carter had that he knew could circle the wagons for his new foundation’s cause: Gov. Pat McCrory. When McCrory was mayor of Charlotte, Omar and his brother Lamar would tag along with their mother, Stephanie Tyson, to Charlotte City Council meetings. McCrory took notice and befriended the family, mentoring them throughout their youth. The families ate dinner together and McCrory cheered the boys on through their successes in school and sports. When Carter was in the hospital, McCrory came to visit. And when Carter decided to start his foundation, McCrory was there to lend his support. Carter’s organization recently held a celebrity basketball game, mixer/fashion show and a bowling party for kids where the governor stopped by to chat, take a few pictures and share in the success of his young mentee’s organization. And thanks to Carter and the organization’s many volunteers, the foundation is off to a thumping start. Read more about Omar's story and watch a video about Omar and His Unstoppable Heart. 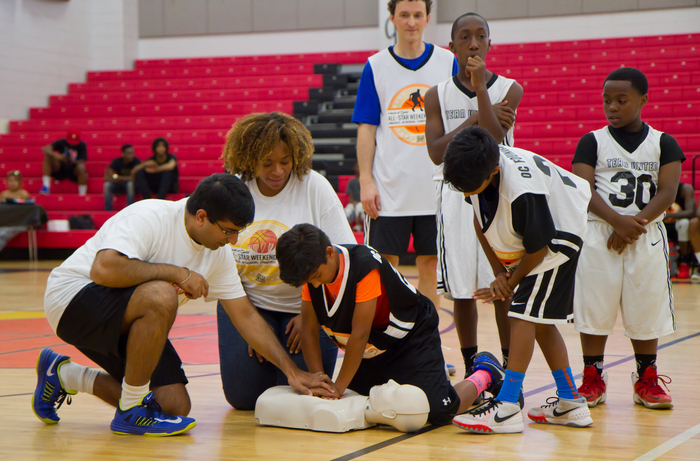 Rohit Mehta, MD, medical director of cardiac electrophysiology at Sanger Heart & Vascular Institute, part of Carolinas HealthCare System (right), teaches children how to perform CPR during an event recently held by The OC Foundation. Dr. Mehta also serves on the board of the foundation.